Amy Johnson was the first British woman to earn a ground engineer's license to work with planes. In 1930, she became the first woman to fly from England to Australia, an 11,000 mile flight. She went on to set more flying records. In 1940, during World War II, she joined the Air Transport Auxiliary, flying Royal Air Force Planes around the country. 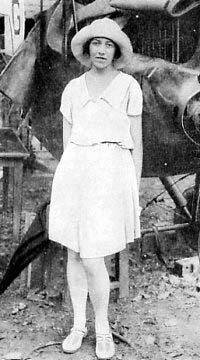 She died in a flight-related accident in 1941. Amy Johnson came through in a seance in 1970. After the normal trials of the voice box, she speaks about people going into space, a new phenomenon in 1970. She says she doesn't know of anyone who has contact with someone on another planet. Betty Greene mentions that George Woods has the flu and Amy says she's amazed that no cure for the flu has been found yet. She says she has little contact with the Earth now. She is learning gradually about the universal laws. But she does say that people on Earth need to learn about death and the afterlife. She says it's dreadful that people don't understand it. There's a form of time in the afterlife, but it's not measured by the sun, moon, stars, and calendar. She continues to have an interest in flying. However, there, they don't need mechanical things to fly. Her husband is interested in developing himself mentally. He's also interested in music and art, and has become much more sensitized since he crossed over. She says she used to come back to Earth, but it's not interesting any more. People can do things on her side of life without any effort. They don't have to communicate in the same way; it's totally different. Those things that seemed important on Earth don't matter any more. People don't have the same needs. She is trying to learn how to express herself better, moving onto another strata and opening her mind to other horizons. She is not interested in material things on the Earth. She says that if people understood the truth of the afterlife, it would help tremendously, but the majority of people are completely blind to it. Often people who should know don't. She says she doesn't think they're interested. They're more materialistic than ever. Everyone has to die, but no one wants to think about or talk about or know about it. The most important things in life, people push aside. She describes her spiritual sense when flying. When she was flying, she was on her own "up there." She did a tremendous amount of thinking, she says. She was much nearer to spiritualism than the average person when she was flying. Mentally, she was highly sensitized by her job. She got away from people and material things, mentally. In an odd, strange sort of way, she felt she was "in touch." It was extraordinary what flew through her mind. Death didn't seem to matter. She thinks a lot of flyers are like that; they drift away from material things. She speculates that the astronauts must feel that, realizing the immensity of life and that it's not purely physical and material. In those moments, she found she was more than she seemed. The body enables people on Earth to experience, but it's something that in itself is a means to an end, not a be all and end all. I look back on my life, I had no fear. I had my moments when I enjoyed things, but I was always happiest when I was away from the earth in a plane. I realize now it was a psychic experience. I was being more tuned in. I was out of the earth and the contamination of material things. I was mentally and spiritually tuned in. She says she thinks she was helped from the other side to a point, but helping people on the earth is a very difficult thing; it depends on the individual. She said it's difficult for them to do very much. It's not until people themselves want to be helped, that it's possible for them to help. Often people in difficulty ask for help or pray and sometimes are helped, but until they open the door those on the other side can't come in. "They shut the door and put the bolt and bar on it," she says. To receive help, the person has to have faith. "Open the door wide," she says, "don't peep through it." Some people are doubtful and fearful, but unless they make some effort, there's nothing those on the other side can do. It's up to the individual. There has to be reciprocation. She continues to explain that in every walk of life, unless the person take risks and takes the effort to find out and experiment, it doesn't achieve anything. The trouble is that the vast majority of people are afraid. She then says that she'd like to educate children. Children annoyed her on life, but now she's interested in young souls, in teaching and helping. There are very young children who need help and guidance. She finds it stimulating and what applies to one may not apply to another. She is quick to quality that when we talk about children, they're not always children who were young on Earth. Sometimes they are immature adults. The mentally retarded on earth are like children. She says it's amazing that the people whom you don't think can teach you much can teach you a great deal, Sometimes they meet people from higher planes. There's always something new and fresh and exciting. Mongoloids [mentally retarded] don't suddenly become very bright when the cross over. The physical side no longer applies, so they're not under the same handicap, but their mental condition is retarded and they have to work on that. Often, they are quite bright in themselves, but their physical brain didn't work right. They have the ability to achieve and when they're not in the body, they're different; they're able to assimilate knowledge and learn. The possibility to achieve is there. In fact, they are much more teachable because they don't have the same problems they had on Earth. In the afterlife, they have a "rarified body," a perfect body. On Earth, the body was imperfect but in the afterlife it is perfect. That immediately brings about certain changes, and then they just need an adjustment of mind and spirit as one in tune with the etheric body and with harmony. The Earth realm is filled with disharmony, not only with deformed children but with all people. People need to create harmony by becoming tuned in. It's much harder for people with strongly fixed ideas that create stumbling blocks than for children, even if they were imperfect and couldn't think clearly. It's easier for them to become different people people, even brilliant and advanced. It is much more difficult for those with strong opinions to learn and advance than for the village idiot. The problem with Mongoloids is physical, but it was never intended that anyone should be born physically or mentally imperfect. Man has done this. The sins of the fathers are visited on the children. We are the product of other people in every way, mentally and physically. All people on Earth are sharing the same spirit. Everyone links up. If generations of people think wrongly, they create wrongly; they create imperfections. The physical conditions of the past catch up with the present and future. Man has created the situation and is responsible for what happens on Earth. If you have imperfect children, man is to blame. Parents may be perfect physically, but may not be mentally, and the problems go back generations. There is no individual on his own; everyone is a product. The whole of the universe is part and parcel of the other people, and we are all part and parcel of the same spirit, manifested in flesh, all linked up with the human race. If we treat animals badly, it reflects on the human race. People can't escape natural law. The things that distress us on Earth are there because man has made them possible. The question of whether a soul chooses a parent is an odd one. It suggests that the consciousness of the individual is there before being born, just waiting for a parent. The earth and the spiritual world, all the different worlds, are just different aspects of man's evolution. There may be life on other planets in the spiritual world. Those on the other side don't look at it in the same way. Man on Earth looks at the earth and the moon and sees the moon as a dead world, but there is a form of life on it. And there are other beings that are separated by centuries of time and miles of distance. She says that all the people she knows have had existence on earth at some previous time and have evolved. The meaning of life is evolution. There's no beginning and no end. Nothing is new; everything has been discovered. Some has been lost on earth, then found again centuries later. There is so much there waiting to be discovered.